Piano I and II with 1-3 vocal chorus parts. Contemporary arrangement of a timeless favorite! Latin-feel style- medium difficulty. 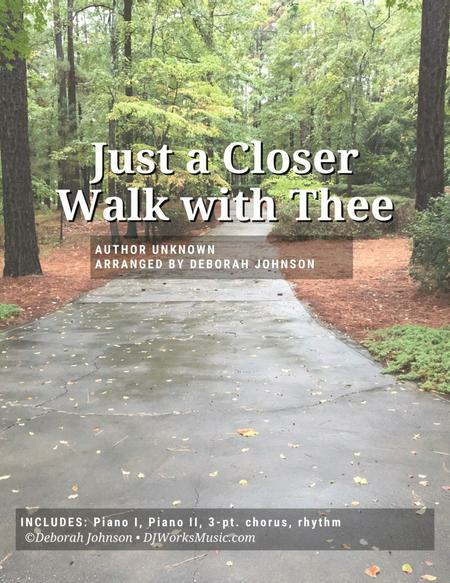 Can be performed with or without vocals.From the GRAMMY Award contender album My Fathers Favorite Hymns, available on Amazon (http://amzn.to/1fSaWVe) or CD Baby (http://www.cdbaby.com/cd/deborahjohnson) by Deborah Johnson. There is also a beautiful spiral-bound devotional guide available with the amazing stories and life principles gained from these timeless classics, as well as all the music arrangements in one spiral-bound volume. Both are available on Amazon. 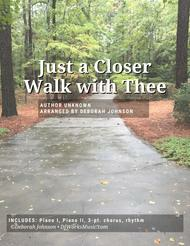 Just a Closer Walk with Thee is a traditional gospel song, author unknown. It was a million-seller for Red Foley in 1950, Elvis Presley recorded it in 1958 and Tennessee Ernie Ford made the charts with it in the late 1950’s. It is perhaps the most frequently played selection in the hymn and dirge section of traditional New Orleans Jazz Funerals.For more information about Deborah, her albums, books and products, visit www.DJWorksMusic.com .